This new tippet material from Trouthunter is some of the best performing Fluorocarbon on the market. 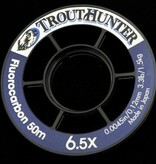 It may be expensive, but you get 50 meters and extremely strong tippet!! Love this tippet. Like it comes in 50 meter lengths and according to some sites, has a higher break strength.